Updated September 3, 2018: Outlander is set to return in November 4, 2018 at 8 p.m. Young Ian, grown-up Fergus, Marsali, Roger and Brianna are set to return in Outlander Season 4. Outlander Season 4 will be based on Diana Gabaldon’s fourth book, The Drums of Autumn. Check out the Outlander Season 4 teaser below. Plus, Outlander was renewed through Seaon 6! 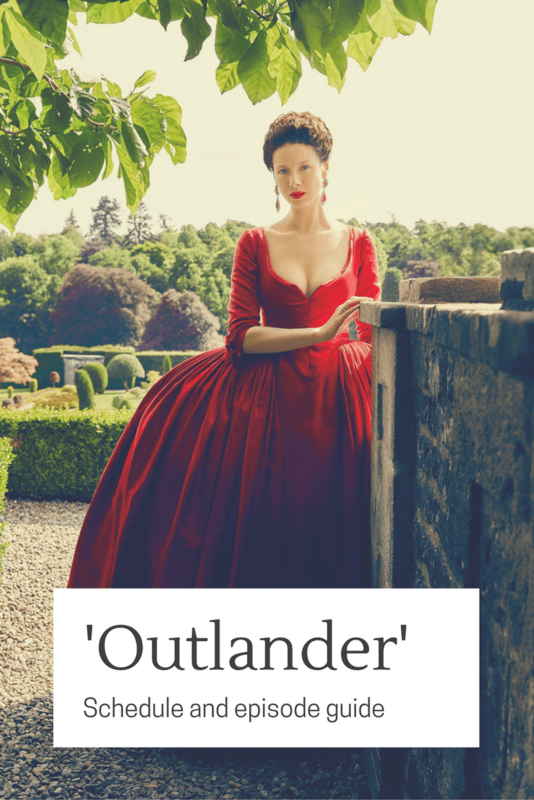 In the meantime, you can download my Outlander cheat sheet for a full list of episode titles in each season, as well as cast information and book reading order. The Outlander schedule for Starz has some tantalizing episode titles. 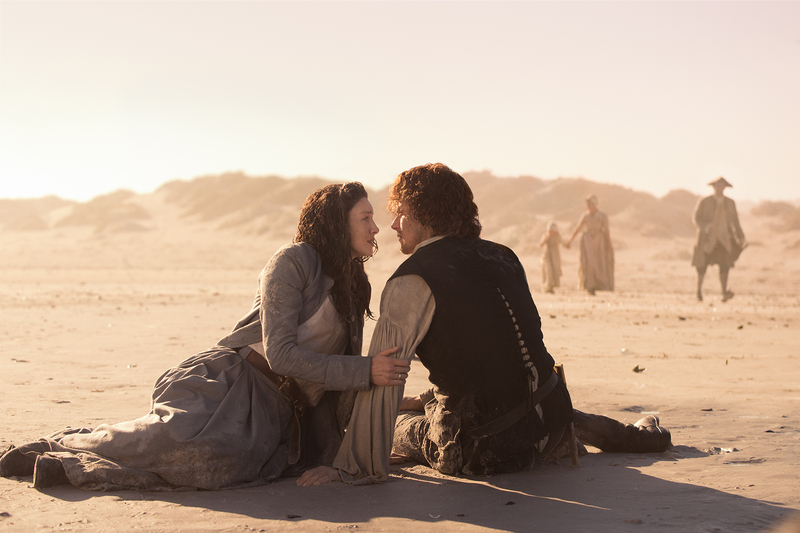 Outlander is based on the series of books by Diana Gabaldon. The story centers on Claire, a married WWII nurse who winds up in 18th Century Scotland. While she’s finding her footing in this earlier time, she falls in love with a Highlander. Soon enough they’re both swept up in the violence and politics of the second rising. While on her honeymoon, WWII combat nurse Claire Randall is mysteriously transported back to 1743 Scotland, where she is kidnapped by a group of Highlanders – and meets an injured young man named Jamie. 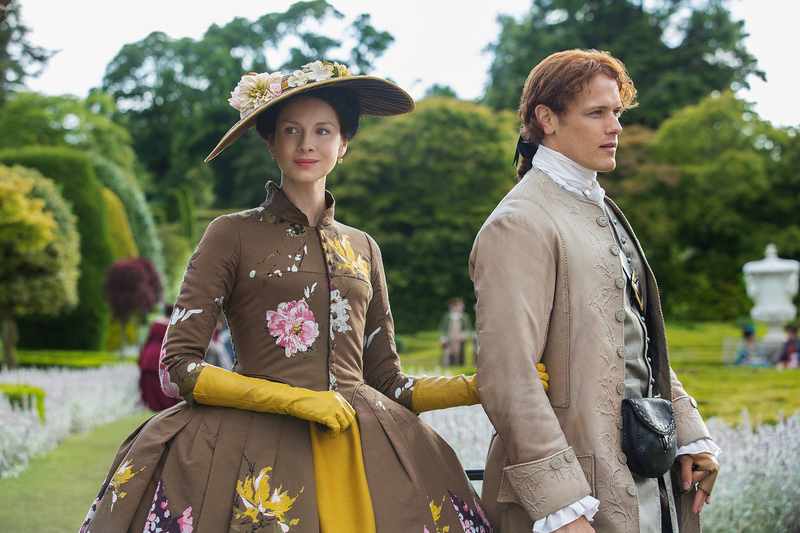 Claire is taken to meet the Laird. As suspicions about her grow, Claire befriends the mysterious Geillis Duncan. When the clan discover her medial skills, Claire goes from guest to prisoner. 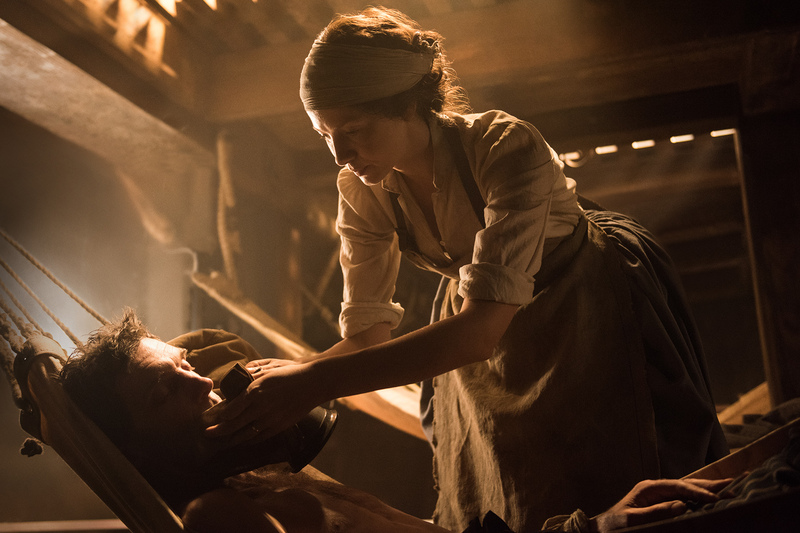 Claire decides to use her medical skills to aid her escape from Castle Leoch – with Jamie’s help, she tends to an ill child. During an evening’s entertainment, a story gives Claire hope for her freedom. 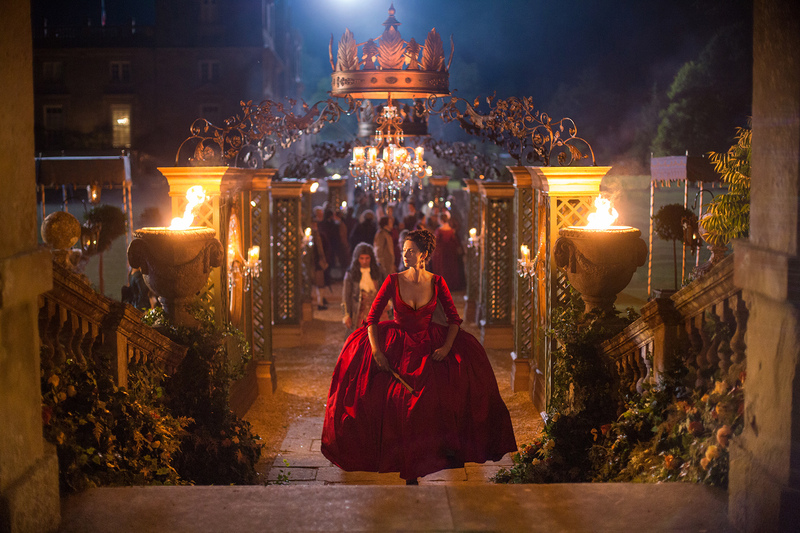 As the Castle prepares for the Gathering, Claire plans her escape. But after a dangerous encounter with a drunken Dougal and an unexpected run-in with Jamie, her plans are dashed. Claire joins the MacKenzie rent-collecting trip. To her horror, Dougal uses Jamie’s scars to gain sympathy for the Jacobite cause. Claire recalls that a defining moment in Scottish history is fast approaching. Claire’s unexpected meeting with a British General turns tense when Captain Jack Randall arrives. Claire finds herself alone with Randall – a dangerous man determined to uncover her secrets. Claire and Jamie are thrown together in marriage, but as their emotional and physical relationship unfolds, deeper feelings arise. Claire is ultimately torn between two men in two very different times. Frank desperately searches for his missing wife, while Claire tries to come to terms with her new marriage. Claire is faced with an emotional quandry as a life-altering opportunity presents itself. Jamie and the Highlanders rescue Claire from Black Jack Randall. Back at the castle, politics threaten to tear Clan MacKenzie apart and Jamie’s scorned lover, Laoghaire, attempts to win him back. Jamie hopes the newly arrived Duke of Sandringham will help lift the price from his head, while Claire attempts to save an abandoned child. Claire and Geillis are on trial for witchcraft. Jamie manages to rescue Claire, but not before she discovers a secret about Geillis’s past. Reunited, Claire and Jamie make their way to Lallybroch – Jamie’s family home. Reality quickly sets in, and old wounds are reopened between Jamie and his sister, Jenny. Jamie finds himself between a rock and a hard place when a redcoat deserter from his past resurfaces. Claire tends to a laboring Jenny while Jamie and Ian join The Watch on an ambush, resulting in devastating consequences. Claire and Jenny set out to rescue Jamie from his redcoat captors. When Murtagh joins up, Jenny returns home to her family while Claire and the Highlander employ unorthodox tactics to send word to Jamie. When word finally arrives, the news is not what anyone had hoped for. Jamie awaits his death sentence at Wentworth Prison, while Claire and the Highlanders desperately search for a rescue plan. Returning to her own time in the 20th century, Claire must reconcile her future with the life and love she left behind. 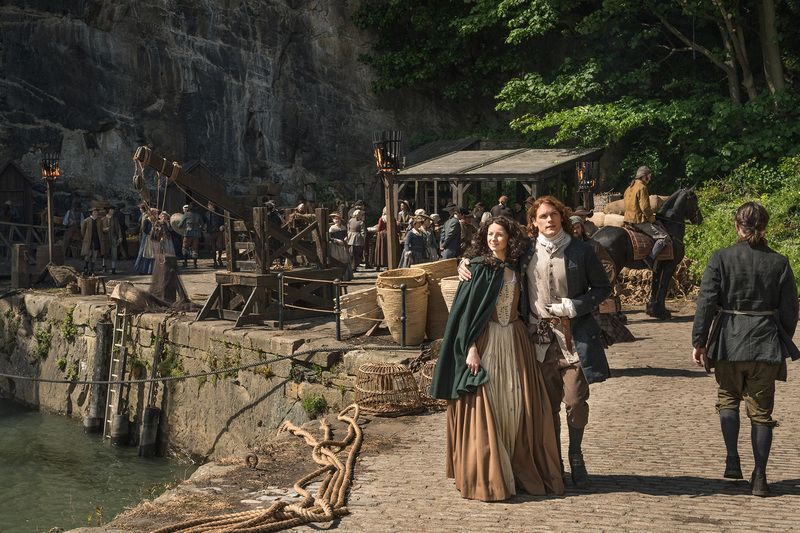 Shifting back to 18th century, Jamie, Claire, and Murtagh arrive on the shores of France to turn the tides of history, but quickly learn that Paris presents its own unique set of challenges. Life in Paris is not without its trials as Jamie struggles to triumph over the traumas of his past. A fortunate meeting with Jacobite leader Prince Charles presents opportunities, while the Duke of Sandringham’s presence brings complications. Jamie’s days and nights are dominated by political machinations, while Claire finds solace in her healing skills. As their plan to stop Culloden progresses, including engaging the aid of a young pickpocket, the past threatens to derail their forward momentum. Claire and Jamie throw an elaborate dinner party intended to derail investors in Prince Charles’ war effort. Meanwhile, Claire’s revelation that Jack Randall is alive sparks Jamie in an unexpected way as he and Claire struggle to regain their physical intimacy. Reunited, Jamie and Claire attempt to extinguish the fires their dinner party ignited; however, Claire is set off on an unexpected change of course. Jamie and Claire’s relationship is put to the ultimate test when the past rears its ugly head. Jamie and Claire use Claire’s medical knowledge to devise a scheme to stop a wine deal which could fill the Prince’s war chest. When Claire learns Jamie has gone back on his word, the couple are met with dire consequences that will forever change their lives. Claire is brought to L’Hopital Des Anges where doctors try to save her life and that of her unborn baby. King Louis asks Claire to judge two men accused of practicing the dark arts – one an enemy, one a friend. 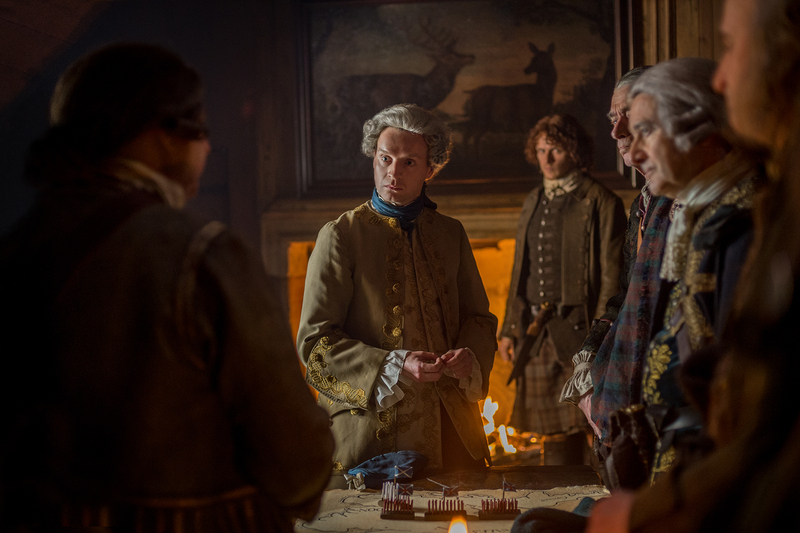 Claire and Jamie call upon Jamie’s grandsire, Lord Lovat, in an attempt to elicit support. However, a visiting Colum MacKenzie has other plans, and Lord Lovat’s manipulations ensure that his own interests will be served. Claire and Jamie reunite with the Lallybroch and MacKenzie men as they train for war. Jamie’s power struggles with Dougal and Claire’s personal battle with her memories of WWII weigh upon them, but new, helpful information comes to light when a young Englishman named William Grey pays a surprise visit to their camp. Trusting in Claire’s knowledge of “history,” Jamie leads the Jacobite army into a critical battle with British opposition near the town of Preston. Meanwhile, Claire attends to the dead and dying, a reminder of the truest costs of war. As Jamie puts all of his efforts into turning the Jacobite army away from the impending slaughter, Claire attempts to comfort the sick Alex Randall. Alex reveals an outrageous plan to save the mother of his child. Flashing forward to 1968, Claire travels to Scotland with her twenty-year-old daughter, Brianna, and meets Roger Wakefield. Claire visits Lallybroch and Culloden Moor to make peace with the past, while Brianna and Roger bond over researching Randall family history. Claire finally reveals the truth to Brianna about her time travel through the stones, her life in 1700’s Scotland, and Brianna’s true parentage. The story is intercut with another one back in the 18th century, which happens on the day of the Battle of Culloden. 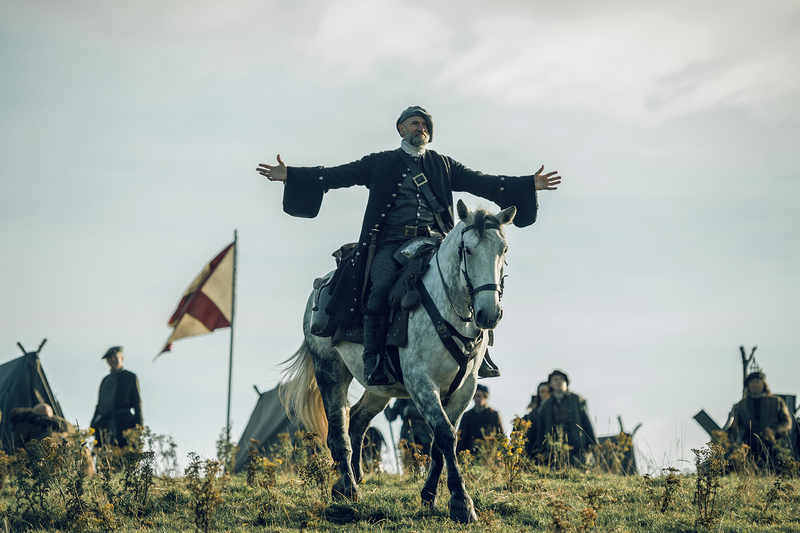 When Jamie’s last ditch attempts to deter The Prince fail, he and Claire come up with a dangerous plan – which Dougal overhears, inciting him to a murderous rage. Jamie must do everything he can to save the ones he loves, even if it means saying goodbye to some – or all –of them. Jamie is at the mercy of unforgiving British victors, following the Battle of Culloden, until a connection from his past provides his only hope of survival. Meanwhile, a pregnant Clarie attempts to adjust to life in 1940s Boston and life with Frank. While serving as a groomsman at Helwater, Jamie is pulled into the intrigue of the British family. In 1968, Claire, Brianna, and Roger struggle to trace Jamie’s whereabouts, leaving Clarie to wonder if they will ever find him. Claire Randall Fraser (Caitriona Balfe) visits the print shop. Brianna grapples with life-changing revelations and Claire must help her come to terms with the fact that she is her father’s daughter. Roger brings news that forces Claire and Brianna to face an impossible choice. After decades apart, Jamie and Claire finally reunite and rekindle their emotional and physical bonds. But Jamie’s new business dealings jeopardize the couples’ hopes for a simple life together. In the aftermath of a violent confrontation, Claire follows her conscience as a surgeon, even though it could put her and Jamie’s lives at risk. At the same time, Jamie attempts to evade the reach of the Crown as its representative closes in on his illegal dealings. Claire returns to Lallybroch with Jamie, where she does not receive quite the reception she was expecting. Unbeknownst to her, Jamie’s made some choices in their time apart which comes back to haunt them with a vengeance. Claire races to discover the source of an epidemic aboard a disease-ridden ship before hundreds of sailors die. And as Jamie locks horns with Captain Raines, Fergus finds himself torn between loyalty and love. After making a leap of faith, Claire washed up on an island where survival is her only option. Navigating treacherous waters crippled the Artemis, so Jamie devises a joyful moment for his crew in the midst of setbacks. Claire is forced to play a game of cat and mouse with an old adversary as she searches for young Ian. The Frasers race through the jungles of Jamaica to prevent the unthinkable. Thanks for reading! What’s your favorite episode? Tell me in the comments! ‘Infinity War’ Theories – Where do we go from here? I love the “Outlander” books…the series will help me survive until the next book(s) are available!!! So will we only see 7 episodes this year and the rest in 2017–or in the fall? Do you know? I don’t think you’re alone!